Brazilian forestry legislation is one of the strictest in the world. It’s what shows the study “Forest and Land Use Policies on Private Lands: an International Comparison”, published by the Climate Policy Initiative (CPI / NAPC) of the Pontifical Catholic University of Rio de Janeiro (PUC-Rio), in partnership with the Brazilian Trade and Investment Promotion Agency (Apex-Brasil). As the name already says, the study analyzes what it means to be in compliance with the new Brazilian Forest Code, comparing the legal obligations in force in seven countries: Argentina, Brazil, Canada, China, France, Germany, the United States. “Comparing forest legislation from different countries, we conclude that Brazilian laws have a very high degree of vegetation protection. It is a differentiating element of our production that can and should be exploited in trade negotiations“, says Mr. Juliano Assunção, executive director of the CPI/NAPC and professor of the Department of Economics of PUC-Rio. To support this statement, Mr. Assunção points to some of the results of the study, which show that Brazil has the greatest extension of forest cover with approximately 490 million hectares. This means that the country has around 59% of forest cover in its territory, equivalent to almost double the other countries. The land with agricultural production occupies only 34% of its territory. In France, on the other hand, forest cover occupies 31% of its territory, and agricultural activities occupy around 52% of the country area. This optimization of land use can be observed in the Brazilian citriculture, which in recent years has adopted a series of technologies and management targeted at increasing its productivity per hectare. The main technique is the densification in groves, which consists in increasing the number of plants in the same area. 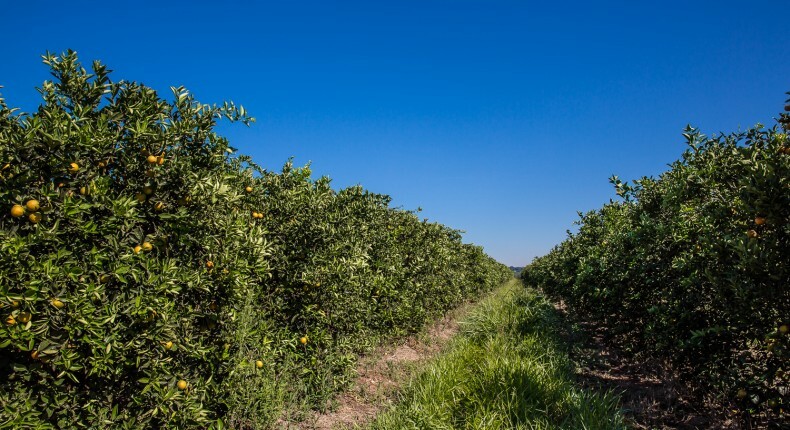 To get an idea, according to data from the Orange Production Forecast (PES), developed by Fundecitrus, in the 1980s an average of 360 trees per hectare was planted in the citrus belt of São Paulo and Triângulo Mineiro. By 2015, this number more than doubled to 656 trees per hectare. In 2016, the number has already reached 719 trees per hectare. Which means, the increase of production happens with no need to expand the planted area. “A strict environmental legislation combined with technologies that increase productivity and reduce the demand for land, as well as sustainability policies in the field, are factors that contribute to this improvement. And this, obviously, counts in favor of the country’s image when it comes to exporting agribusiness goods“, says the president of Apex-Brasil, Ambassador Roberto Jaguaribe.